Head into the Aztec jungles as you help Gonzo on his quest for the mystical city of El Dorado and more than a little gold. We love the fantastic sounds and images of Gonzo’s Quest mobile slot, transporting you into an ancient jungle full of the unique features you’ve come to expect from NetEnt games. This is probably Net Entertainments most well known slot machine, and easily one of the most popular. The theme is particularly well thought out and plays as beautifully on mobile and tablet as it does online. Sure, you don’t get Gonzo jumping up and down every three minutes, as you do with the online slot, but we think this is actually a good thing, making the experience all about the reels and the spins. In our opinion, selfish Gonzo was a little annoying anyway, moonwalking across the screen when we had no need to see him. The mobile version strips this video slot of the distracting graphics and concentrates on the crunching crumbling stones as they disappear from view. Because at heart Gonzo’s Quest slot, no matter how you play, is a very simple game. Looking at it, many assume this video slot has a million features and complicated mini-games, but good graphics does not mean complications. In fact, it really only has two features, free spins and avalanche. The avalanche feature, or tumbling reels, particularly pops, with the crash of falling rocks and continuous increasing multipliers keeping you engrossed in the game. It does mean sacrificing frequently hitting free spins, but these are more than made up by the mini additional symbols you get through the game via the avalanche feature. When the free spins do come however, this is where you’ll get the biggest wins in the game with a maximum potential jackpot of €£$93,750 if you manage to hit that 15x multiplier. However don’t be expecting to hit big amounts with this mobile slot . The reason why it has become so popular worldwide is because this game combines simplicity of game play, with primarily the avalanche feature to keep you entertained, beautiful enticing graphics and small constant payouts. The return to player rate is a medium 96%, but you’ll get hits 41% of the time. Though we have plenty of stories of big winners on Gonzos Quest slot game, mostly this NetEnt slot is here to entertain and entice you with the avalanche feature. But that’s is the main beauty of Gonzo’s Quest mobile slot. Players who want entertainment get it with the constant action and smalls wins to keep playing, yet deep in your heart you watch those ever increasing multipliers slowly go up to x2, x3, x5… maybe even x15. It’s a mid volatility slot that wants to be a really big hitter when it grows up one day. This may never happen, but for those who want to make their budget last for long and still dream of a fairly decent win when the free spins come knocking, this is the mobile slot machine for you. Avalanche: Removing the spinning reels, these totem rocks fall into place within the reels, with winning totems getting crushed and replaced by more rocks from above. If you continue to win, the multiplier grows, starting from x1 to x5 and resetting again. As soon as you stop the winning streaks, all the rocks disappear and a new set appear to cover all the reels. Free Fall Symbols: Each bet line containing 3 free fall symbols activate 10 free falls (the equivalent of free spins. These must appear in succession starting from the left most reel. Wild symbols, thank-fully, substitute all symbols, including the free fall icons, making this not as rare an occurrence as you might think, but still pretty elusive. In turn the avalanche multipliers are increased during the free falls, increasing by 3x, 6x, 9x, and 15x. 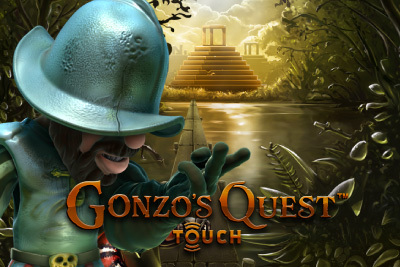 Gonzo's Quest Touch may be one of the most perfect mobile slots for those who like mid variance game play. It doesn't have a million features, with just the tumbling avalanching reels to keep you occupied for 80% of your time, but for every win your eyes will be stuck to that multiplier meter on the top left hand side of your screen, hoping the next set of crumbling stones give you that big win you'd been waiting for. It's entertaining and it pays out often enough that you won't notice that you are not often above your starting bank roll - far more than other cascading games such as Pixies of the Forest or Transformers. This slot isn't here to pay out often, but every so often... it surprises you with a big win that can be as much as much as 50 to 100 times your bet. Get the free spins feature and you can see that increase to as much as 200 times your bet. With a unique approach to free spins and a great tumbling reels feature which keeps the game flowing and rolling, the Aztec city of gold is easily within your reach in this mobile slot.